236-238 Beacon are located on the NW corner of Beacon and Dartmouth, with 234 Beacon to the east, across Dartmouth, 240 Beacon to the west, and 330 Dartmouth to the south, across Beacon. 236 Beacon and 238 Beacon were built in 1869-1870, a symmetrical pair of houses with a shared entrance portico. The land for 236-238 Beacon was purchased on January 5, 1869, by textile manufacturer John Fox Slater from dry goods merchant Eben Dyer Jordan, co-founder of the firm of Jordan, Marsh & Co. The land originally was two lots, a 32 foot wide lot at the corner of Dartmouth, which Eben Jordan had purchased on February 13, 1866, from J. Huntington Wolcott, and a 30 foot wide lot to the west, which Eben Jordan had purchased on November 18, 1865, from Samuel Henry Gookin. Both lots had originally been purchased from the Boston and Roxbury Mill corporation on October 20, 1863. John F. Slater subdivided the combined parcel into two 31 foot wide lots. He retained the lot on the corner and sold the lot to the west on June 8, 1869, to J. Huntington Wolcott (who originally had sold the corner lot to Eben Jordan). Click here for an index to the deeds for 236-238 Beacon. Bainbridge Bunting’s Houses of Boston’s Back Bay does not attribute 236-238 Beacon to a specific architect. However, the deed transferring the lot for 238 Beacon includes extensive provisions designed to ensure that the house to be built by J. Huntington Wolcott will conform to the plans of 236 Beacon “drawn for and accepted by said Slater and now in the hands of Snell and Gregerson…”. 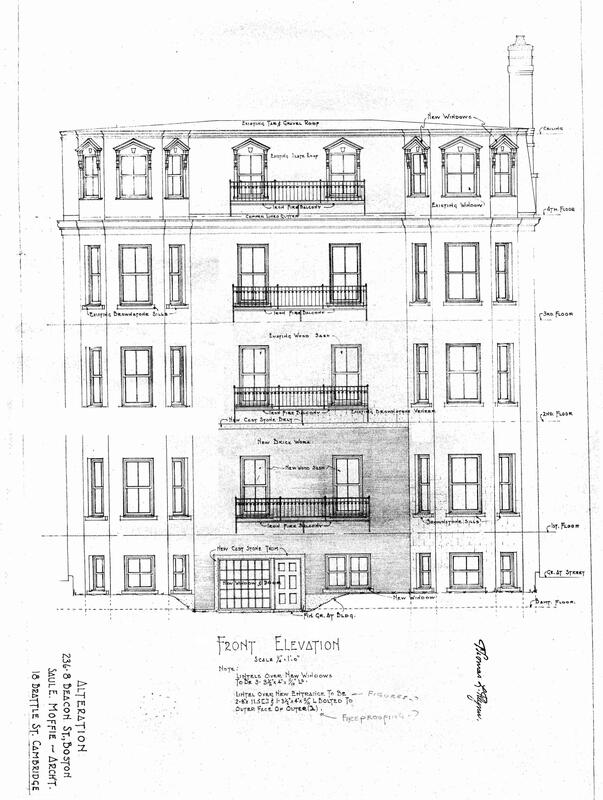 Click here for a section drawing of 236 Beacon as recorded with the deed. From this, it can be concluded that both houses were designed by Snell and Gregerson. 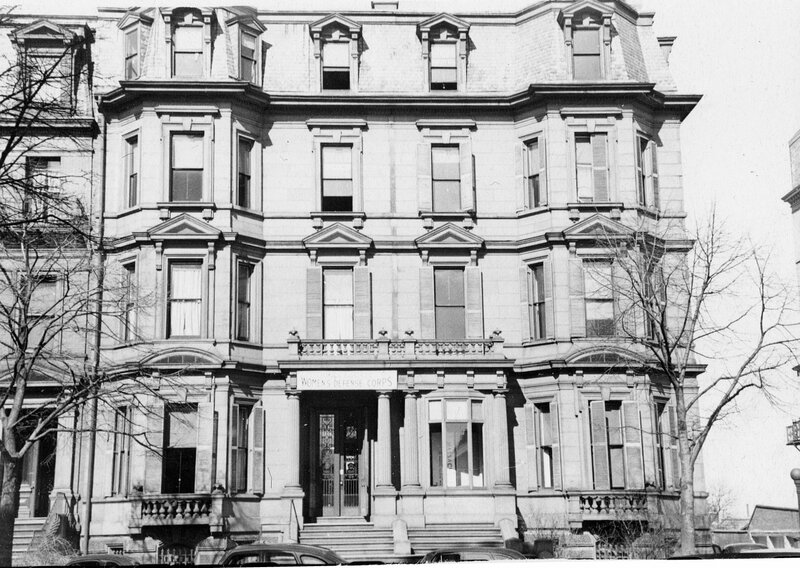 However, a January 1, 1870, article in the Boston Daily Transcript Supplement, commenting on new buildings on Beacon Street, states “I & H. M. Harmon have built a fine brown-stone front four-story dwelling for J. H. Wolcott. Emerson & Fehmer furnished the plans.” From the date and the ownership, this would appear to be 238 Beacon (although the article identifies it as 146 Beacon, which was built in the early 1860s). It is therefore possible that Emerson and Fehmer were J. Huntington Wolcott’s architects 238 Beacon, presumably designing the house to conform with 236 Beacon, designed by Snell and Gregerson. 236 and 238 Beacon were combined into one building in 1914 and the façade was significantly remodeled in 1950-1951, designed by architect Saul E. Moffie. 236 Beacon was built in1869-1870 for John Fox Slater as the home of his son-in-law and daughter, Francis Bartlett and Marianna Hubbard (Slater) Bartlett, who had married in March of 1869. John Fox Slater was a cotton manufacturer in Norwich, Connecticut. A noted philanthropist, in 1868 he gave $1 million to establish the John F. Slater Fund to support the education of emancipated slaves. Francis and Marianna Bartlett moved to 236 Beacon upon its completion in mid-1870. They previously had lived with his parents, Sidney and Caroline (Pratt) Bartlett, at 95 Beacon. Francis Bartlett was a lawyer. On December 30, 1870, John F. Slater transferred 236 Beacon to his daughter. Marianna (Slater) Bartlett died in January of 1873. She died intestate and 236 Beacon was inherited by the Bartletts’ two infant daughters, Caroline Bartlett and Elizabeth (Lillie) S. Bartlett. Francis Bartlett continued to live at 236 Beacon. He also maintained a home in Prides Crossing. Elizabeth Bartlett died in February of 1881 and her father inherited her interest in the property. Caroline Bartlett married in June of 1891 to Herbert Mason Sears, a banker. After their marriage, they lived briefly at 170 Beacon and then at 287 Commonwealth. During the 1894-1895 winter season, Francis Bartlett was living elsewhere and 236 Beacon was the home of stockbroker Guy Norman and his wife, Louisa (Palfrey) Norman. They had lived at 254 Beacon during the previous season. The Normans had moved by the 1895-1896 season and by the next season were living at 262 Beacon. Caroline (Bartlett) Sears died in January of 1908. In her will, she left her one-half interest in 236 Beacon to her husband. Francis Bartlett continued to live at 236 Beacon until his death in September of 1913. In his will, he left his one-half interest in 236 Beacon (inherited from his daughter, Elizabeth), to his grand-daughter, Phyllis Sears, the younger daughter of Herbert and Caroline Sears. On July 21, 1914, 236 Beacon was purchased from Herbert Sears (in his own right and as guardian of Phyllis Sears, who was still a minor) by Pauline (Shaw) Fenno, the widow of Lawrence Carteret Fenno, who lived at 238 Beacon. 238 Beacon was in 1869-1870 as the home of wholesale textile merchant Joshua Huntington Wolcott and his wife Harriet (Frothingham) Wolcott. They previously had lived at 48 Boylston. Their son, Roger Wolcott, lived with them. He graduated from Harvard Law School in 1874 and in September of 1874 married Edith Prescott. After their marriage, they first lived at 238 Beacon with his parents, but by 1877 were living at 22 Commonwealth. He was a lawyer and later would served as Governor of Massachusetts. J. Huntington Wolcott died in January of 1891. Harriet Wolcott continued to live at 238 Beacon until her death in April of 1899. On November 17, 1899, 238 Beacon was purchased from Roger Wolcott by Pauline (Shaw) Fenno, the wife of wholesale wool merchant Lawrence Carteret Fenno. During the 1899-1900 winter season, they lived at 120 Beacon while their new home was being renovated. They also maintained a home at Beverly Farms until about 1910, when they built a new home in Rowley. L. Carteret Fenno died in January of 1911. After his death, Pauline Fenno lived primarily in Rowley, frequently spending her summers in England. Their four daughters — Pauline Fenno, Florence Fenno, Marian Shaw Fenno, and Sarah Elizabeth Fenno — lived with her. By the 1912-1913 winter season, 238 Beacon was the home of Pauline Fenno’s sister, Marian (Shaw) McKean, the former wife of Henry P. McKean. In November of 1914, she married again, to Malcolm Graeme Haughton, Jr., a cotton broker. They lived at 238 Beacon after their marriage. After acquiring 236 Beacon in July of 1914, Pauline Fenno combined the two houses, cutting through doors in the party wall to make it into a single-family residence. The Haughtons continued to live there through the winter season of 1916-1917. They also maintained a home at Prides Crossing. In June of 1918, the Haughtons purchased and subsequently moved to 13 Commonwealth. Pauline Fenno and her daughters resumed living at 236-238 Beacon during the winter seasons. They continued to live at Rowley in the summers and to travel to Europe frequently. Marian Fenno married in December of 1925 to William Brown McIlvaine, Jr.; after their marriage, they moved to Chicago where he was an attorney. Florence Fenno married in December of 1930 to Clement M. Burnhome, a banker; after their marriage, they lived in an apartment at 101 Chestnut. 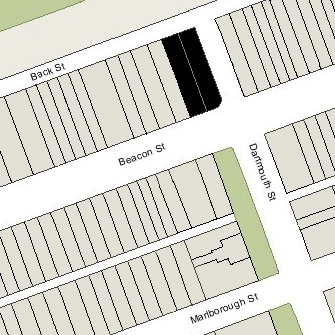 On September 7, 1927, Pauline Fenno joined with her neighbors at 240-246 Beacon in an agreement prohibiting for ten years (until January 1, 1938) any new building or structure behind their houses any taller than 26½ feet. Pauline Fenno continued to live at 236-238 Beacon with her unmarried daughters, Pauline and Sarah Elizabeth, until about 1941. In December of 1941, Pauline Fenno applied for (and subsequently received) permission to convert 236-238 Beacon into offices and lodging for the Massachusetts Women’s Civilian Defense Corps. The organization remained there for about a year, after which the house was shown as vacant in the city directories. 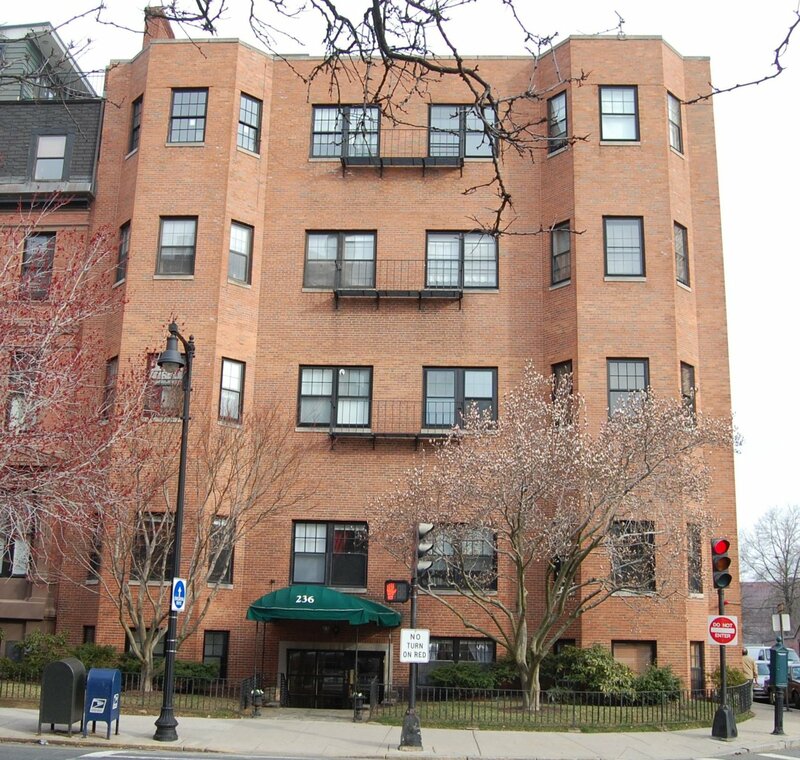 In October of 1944, 236-238 Beacon was acquired from Pauline Fenno by Glenwood J. Sherrard and Margaret S. Henderson, trustees of the 236 Beacon Street Trust. Glenwood Sherrard was the proprietor of the Parker House hotel, and Margaret Henderson was the wife of real estate dealer Elliott Henderson. 236-238 Beacon appears to have remained vacant until about 1947, when it became a multiple dwelling, probably a lodging house. In November of 1950, 236-238 Beacon was acquired by architect Saul E. Moffie. In December of 1950, he applied for (and subsequently received) permission to remodel the property and convert it from a single-family dwelling into apartments, with ten units in each building. Saul Moffie’s original plans for the remodeling included lowering the entrance to the basement level and modernizing the entry, eliminating the original balustraded portico above the former entrance and refacing the façade between the bays with brick up to the second story. The original brownstone would have remained on the bays and above the second floor, and the original slate mansard roof and fourth floor windows would have been retained. Architectural plans for this proposed remodeling — including elevations and floor plans — are included in the City of Boston Blueprints Collection in the Boston Public Library’s Arts Department (reference BIN R-119). In June of 1951, he submitted amendments to the permit applications to reface the entire front and side façades with 12″ brick. As part of this change (but not mentioned in the amendments) he also replaced the mansard roof and window details to achieve a modernized façade. In March of 1958, Saul Moffie acquired 240 Beacon and that same month he applied for (and subsequently received) permission to cut doors between 236-238 and 240 Beacon, combining the three buildings into one property. On the same day, he applied for (and subsequently received) permission to remodel 240 Beacon and convert it from a school into seven apartments. By 1964, 236-240 Beacon was composed of 29 units. 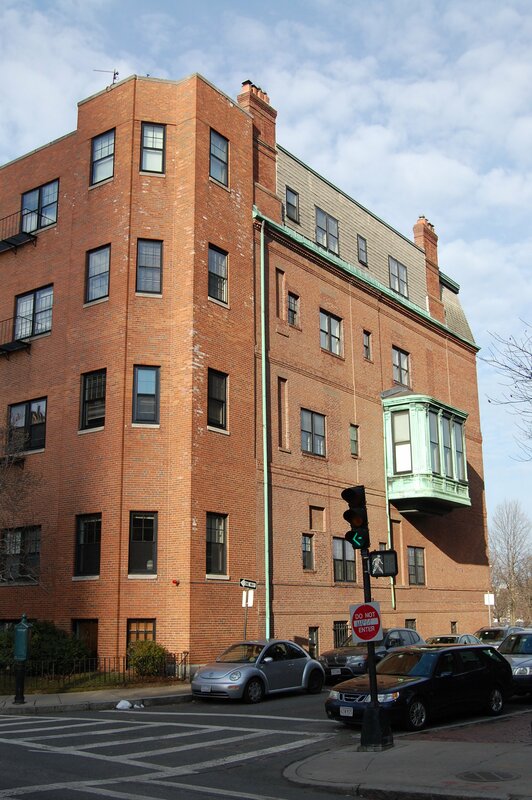 In January of 1970, the Beacon Street Improvement Trust filed for permission to raze 236-238-240-242-244-246 Beacon Street and replace them with a 36 story steel framed and brick clad tower at the northwest corner of Beacon and Dartmouth. The building would have 133 units and a 135 car garage. A companion, 32-story building was proposed at the same time on the northeast corner of Beacon and Dartmouth, replacing 222-224-226-228-230-232-234 Beacon. The proposed twin-tower project met with strong opposition from residents and was abandoned after the City established height limits on all buildings in the residential portion of the Back Bay. On December 7, 1971, 236-238-240 Beacon were acquired from Saul Moffie by real estate developer Elisha Russell (Greenhood) Greenwood, and on June 9, 1972, they were acquired from him by Property Development Associates, Inc., of which he was the president. On August 25, 1972, Property Development Associates converted the property into 28 condominium units, the 236 Beacon Condominium.